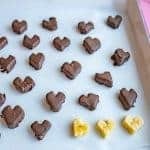 Chocolate-covered banana hearts made with only two ingredients are great treats for kids to help make and eat. Peel and cut the bananas into circles. Cut the banana slices into hearts by cutting the bottom to make it pointy and then cutting a ‘v’ into the top. Dip the banana hearts in the chocolate, one at a time. Fish them out with a fork and tap the fork on the edge of the bowl to remove any extra chocolate. Place dipped hearts on a cookie sheet lined with wax paper or parchment paper. Repeat until all your hearts are covered, reheating the chocolate as needed. Refrigerate until you are ready to serve. These are also great frozen. Store leftovers covered in the fridge for up to two days. Freeze for longer storage. You can use whatever chocolate you like. I used Ghirardelli melting wafers because they are so easy to use and aren’t fussy (but taste amazing). Bananas are so easy to cut! Get the kids involved – they can use a butter knife.